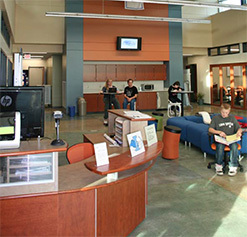 The I-TEC Center is a dedicated district-use facility designed to foster 21st-century learning for the school community. Within this dedicated space for collaboration, teachers benefit from the opportunity to be a part of a community of learners immersed in the learn lab and best practice as it relates to student engagement through technology and teamwork. Students also benefit from the opportunity to have a place to learn in a non-traditional setting fostering collaborative conversation and extended day learning. Community members are given the opportunity to experience 21st century learning through community education outreach.